If you like tailored, minimalist styles, but are ready for making a statement with your jewelry (and honeybunch, after 50, it's time), here are some standout pieces from Arnold Lawrence. The '50s and '60s are usually referred to as 'retro' and 'modern' but items of the finest craftsmanship are timeless, and a relatively good buy now, since they are not yet "antique". People deciding to sell family pieces in the current meltdown will be parting with some retro treasures, so build your eye and piggy bank now. 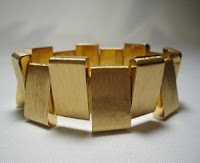 18k yellow gold '60s mod bracelet, $3, 500. 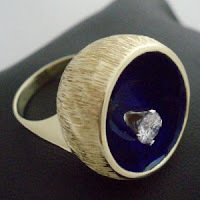 Blue enamel and 14k gold cup ring with 'en tremblant' (moving) 5mm diamond (about a half-carat), $2, 250. A raffish cut above the me-too diamond, and a good buy. Lawrence does not give cutting grade or colour for diamond, but says it is fine. (More photos on the site). I'm captivated by this ring! A classic ruby and sapphire bracelet set, 1950s, by Sophia D. $9, 500 for both. 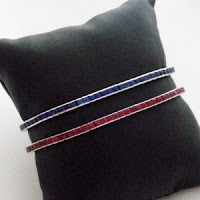 75 French-cut stones per bracelet, set in platinum. Not in my budget, but building your eye this way will help you separate the exquisite from the ordinary in retro pieces beginning to flow into the vintage jewelery market. good point about building the eye, Duchesse -- I'm not much of a ring or even a cuff/bracelet wearer, but I love seeing what you present here just for the aesthetic training and your very knowledgeable comments. I love the bracelets, unfortunately I'll probably be one of the ones doing the selling during the recession not the buying!